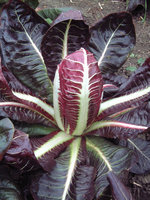 Growing chicory is not difficult: you start the seed in modules, transplant and let them grow. The leaves perk up cool weather salads and are delicious lightly cooked. They are robust and tolerate most climates and soils and a rarely troubled by pests or disease. Their long season of use from mid-summer right through to spring makes them an excellent choice to keep your garden productive. Take the plunge! Three tasty ways of enjoying this crop: lovely rosettes can be harvested during the winter and early spring, sow earlier and use the long narrow leaves as a tender salad ingredient or spring sow for baby leaves. The choice is yours; the superb flavour could be yours too.